Abstract: The ASUS EAH5770 CuCore/2DI/1GD5/A videocard might just hit that wonderful sweet spot where price and performance balance perfectly... you know, when time itself becomes fluid and games run smooth at wide resolutions with all the fancy new graphics eyecandy options enabled. When it comes to graphics cards that are good enough to game on every day, but affordable and not mainstream to bog down modern 3D FPS games, that happy mix is one ATI Radeon HD 5770 GPU and a sticker price in the region of $200 bucks. Coming in just under that figure, Asus' EAH5770 CuCore videocard is an affordable DirectX 11 card to consider. The card comes packing 1GB of GDDR5 RAM and with a GPU ticking away at 850MHz. In terms of performance, the Radeon HD 5770 GPU slots in just below ATI's flagship Radeon HD 5870 and 5850 chips, but above the mainstream Radeon HD 5670. The Radeon HD 5770 graphics chip is based on the ATI RV840 'Juniper' GPU, a 1.04-billion transistor die manufactured on a the 40nm process. All of AMD's Radeon 5000-series of graphics cards share a number of new technologies, the most important of which is support for DirectX 11. This latest revision to Microsoft's graphics hardware standard brings two major additions to the DX11, tessellation and compute shaders. 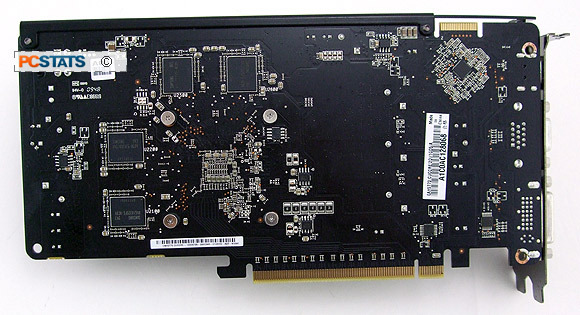 ASUS have clocked the Radeon HD 5770 GPU at 850MHz on this videocard, and it's connected along a 128-bit bus to 1GB of GDDR5 memory running at 1.2GHz. Being quad-pumped, the effective memory speed is a mouth watering 4.8GHz. For reference, ATI's RV840 GPU has 800 shader processors which is the same amount as the Radeon HD 4870 and Radeon HD 4850 from last season. As part of the Radeon HD 5000-series of videocards, the Asus EAH5770 CuCore videocard supports DirectX 11 and Shader Model 5.0, as well as OpenGL 3.2. The PCI Express x16 ASUS EAH5770 CuCore videocard can be teamed up in CrossfireX mode on compatible Intel and AMD motherboards. User's Manual, Driver CD, Utility CD, Alone in the Dark, HDMI to DVI converter, molex to PCI Express adapter, CrossfireX bridge. 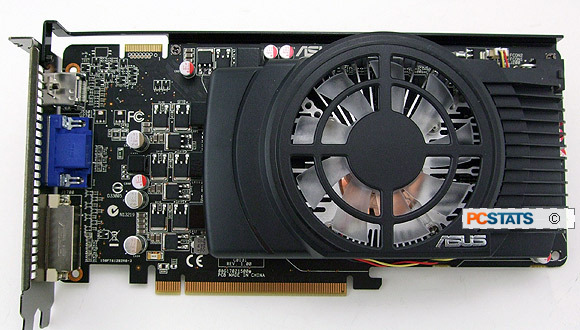 The ASUS EAH5770 CuCore/2DI/1GD5/A videocard retails for around $180 USD ($190 USD, £135 GBP), making the nearest competitor the NVIDIA Geforce GTX 260 videocard or the Radeon HD 4870/4890 it is intended to replace. PCSTATS will be putting all three of these videocards head to head on the test bench a little later in this review. The ASUS EAH5770 CuCore/2DI/1GD5/A videocard is equipped with HDMI, analog VGA and DVI video outputs, and can power up to two displays at a time. The videocard comes with a HDMI to DVI converter, in case your monitor doesn't accept HDMI input. The Asus EAH5770 CuCore can support resolutions of up to 2560x1600 using its DVI connection, 2048 x 1536 using VGA or 1920 x 1200 using its HDMI 1.3 output, which also carries and audio signal. Like most Radeon 5000-series videocards, the Asus EAH5770 CuCore supports onboard hardware HD decoding technologies. ATI's AVIVO HD video technology allows the GPU to process video streams using the Universal Video Decoder. The Asus EAH5770 CuCore also supports ATI Stream acceleration, with OpenCL and DirectCompute support for applications like video encoding. The card requires one 6-pin PCI Express power connector, in addition to the power it draws it from the PCI Express x16 slot its plugged into. Moving from the Radeon 4000 series to the Radeon 5000 series has also seen a die-shrink from 55nm down to 40nm, so the Asus EAH5770 CuCore's TDP remains quite low, at just 108W. This is considerably lower than videocards based on NVIDIA's GT200 and GT200b GPUs, which typically draw upwards of 150W. 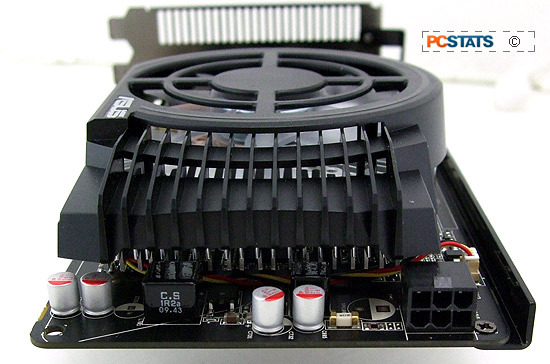 The EAH5770 CuCore also comes with a molex-to-PCI Express power converter if you need it. ASUS' EAH5770 CuCore/2DI/1GD5/A videocard can be paired up with another Radeon HD 5770 or 5750 videocard in CrossfireX mode, with both videocards sitting in a compatible motherboard and connected together using a Crossfire bridge (included with the EAH5770 CuCore). Cooling for the Radeon HD 5770 GPU comes care of the massive CuCore cooler - basically a larger copper block with an extruded aluminum heatsink surrounding it. The heatsink is cooled by a modestly low noise fan, which in tern is covered by a plastic grating. The design of the Asus EAH5770 CuCore videocard's cooler doesn't push air out of the back your case, so it's a good idea to have an internal fan set up to push air out of the back of the case. ATI's Radeon 5770 graphics card is powered by the RV840 'Junpier' GPU, the middle child of ATI's 'Evergreen' family of 5000-series Radeon videocards. As the mid-range offering the 'Juniper' Radeon HD 5770 is between the mainstream 'Redwood' Radeon HD 5670 and the high-end 'Cypress' Radeon HD 5850 and 5870 videocards in terms of price, power and complexity. All of AMD's Radeon 5000-series of graphics cards share a number of new technologies, the most important of which is support for DirectX 11. This latest revision to Microsoft's graphics hardware standard brings two major additions to the DX11, tessellation and compute shaders. Tessellation is a method of adding density and complexity to a 3D mesh. It can take a simple, low-poly model and break up the geometry into more complex portions, adding another layer of detail on top of a mesh. The end result is better looking, more detailed graphics with a very low cost in performance. Compute shaders allow DirectX 11-based GPUs to do tasks normally reserved for CPUs. This will play a big role in desktop applications that harness the power of a PCs videocard, as well as enable games programmers use the GPU to compute things like physics and AI. Again, this opens up the possibility for more immersive gaming, but with a miniscule performance penalty when compared to using a CPU. The ATI RV840 GPU in the ASUS EAH5770 CuCore/2DI/1GD5/A videocard contains some 1.04 billion transistors manufactured on a 40nm process, or about half of that used on the massive 2.15 billion transistor 'Cypress' GPU (Radeon HD 5870). If you take a look at the chart below, you'll actually notice quite a few similarities to last-generation's flagship, the Radeon HD 4870 videocard. Both videocards have around 1 billion transistors, 800 stream processors, 40 texture units and 16 raster operators. ATI uses GDDR5 with all of its Radeon HD 5000-series of videocards, and in this case the 'Juniper' Radeon HD 5770 is equipped with 1GB of GDDR5 video memory with a base clock of 1.2GHz, which is then quad-pumped up to 4.8GHz. Thanks to the increase in memory speed the memory bus can be shrunk from 256-bits down to 128-bits as well. A little bit of GPU to memory bandwidth is lost in the process so the ATI Radeon HD 5770 averages around 77GB/s bandwidth, while the Radeon HD 4870 averages 115GB/s. Furthermore, thanks to a die-shrink to 40nm, ATI is also able to make the RV840 'Juniper' GPU draw a little less power than the previous generation. Pg 2. Overclocking past 900MHz GPU?